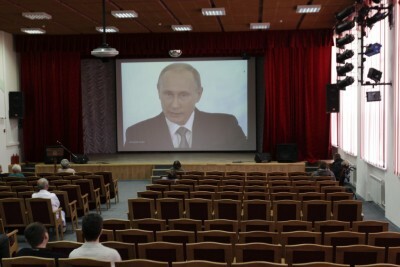 TV broadcast showing Russia’s President Vladimir Putin delivering his annual state of the union speech to members of parliament and other top officials in the Kremlin, in Stavropol, December 4, 2014. Crimea for Russians is “like the Temple Mount in Jerusalem” for Muslims and Jews, Putin said, and would be regarded this way “from now on and forever.” Vladimir the Great was baptized in Kherson, Crimea, Putin explained in his annual state of the Union address yesterday to parliament and top officials in Moscow, an event in 988 that is considered to be the beginning of the Christianization of Kievan Rus, a precursor state to Russia and Ukraine. Historians argue over whether Vladimir was baptized in Vasilev, near Kiev, rather than Kherson, said Zubov, who lost his post at the Moscow State Institute of International Relations in March after he compared Putin’s takeover of Crimea to Nazi leader Adolf Hitler’s annexation of Austria in 1938. From a religious viewpoint “Kiev is a much more important place for Russian Orthodox pilgrims than Crimea,” said Deacon Andrei Kuraev, a theologian and a popular Russian blogger. It’s “incorrect” to compare Crimea with the Temple Mount, the holiest place on Earth for Jews, he said. 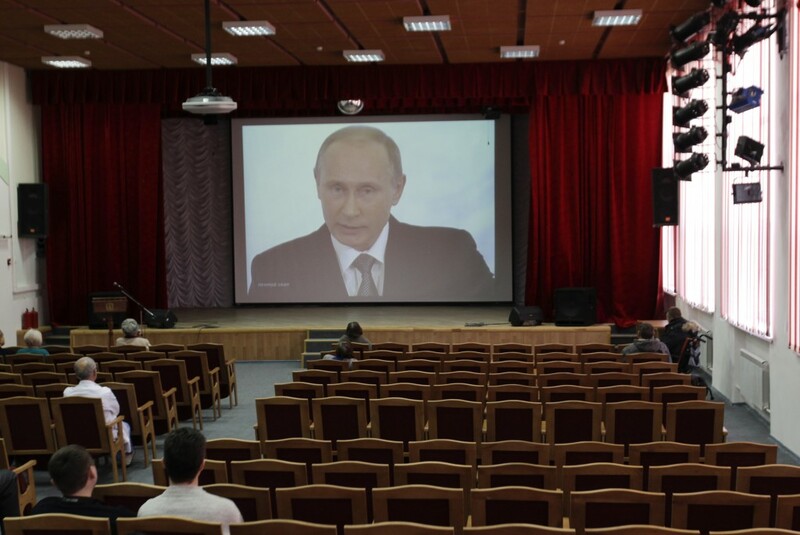 Putin’s comparison of Crimea with Jerusalem is “not a very successful move” to justify Russia’s actions, said Igor Danilevsky, head of historical research methods at Moscow’s Higher School of Economics. Only 25 percent of Russians knew that Prince Vladimir began the baptism of Russia in 988, according to a 2013 poll by the Public Opinion Foundation. A survey it conducted in May found that 31 percent of Russians have visited Crimea. It looks like Putin needs to go back to school to learn the history of Russia and its neighbors . Does it really matter what we think? I can tell people how important Blood River Day was in my culture and you might read about it intellectually but not feel the emotional history. Every country has a mystical bonding with certain landmarks and places. The common word would be patriotism. Nothing but a gangsta thug.